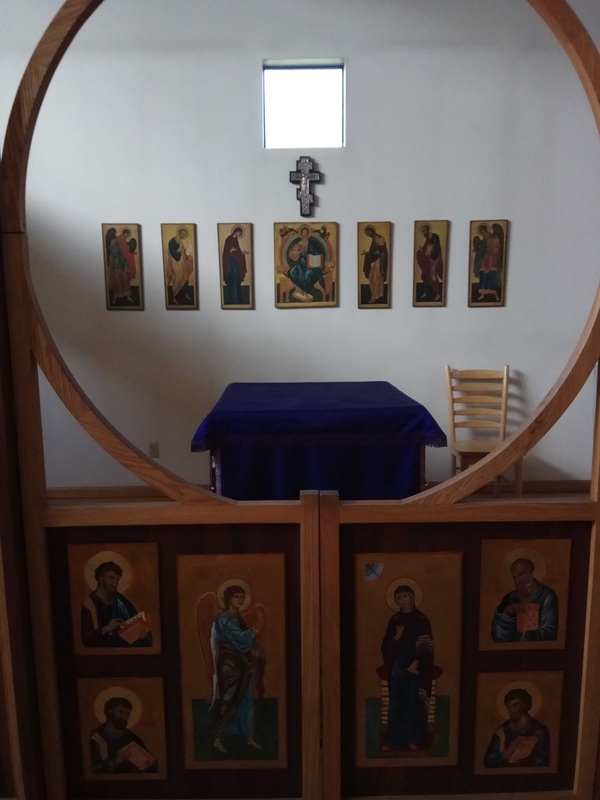 As we begin the Roman Lent, we are happy to share with our readers this guest article by Mr Philip Gilbert on the first ceremony of Lent in the Byzantine Rite, Vespers on the Sunday of the Expulsion of Adam from Paradise, also known as Forgiveness Sunday. We recently published photographs and a video of Mr Gilbert’s subdiaconal ordination, which took place on December 31st at his home parish, St Peter Eastern Catholic Church in Ukiah, California, also the setting of the photo and the three videos below. A Russian icon of the 16th century, representing the Holy Trinity, the expulsion from Paradise, and monks contemplating mortality as they see an open coffin with a half-decayed corpse in it. Yet before we set out on the journey of the Fast and fully enter the time of purification and repentance, there is the Sunday of Forgiveness. The season of the Great Fast begins liturgically on Sunday evening, at what is known as “Forgiveness Vespers.” This service begins with bright (festive) vestments and altar cloths, but halfway through, these are exchanged for dark-colored Lenten ones. The altar is vested, but otherwise left bare until the Presanctified Liturgy on Wednesday, for it too is fasting. At this point the music also changes to the more somber music of the season. God is ready and willing to forgive sinners, but we sinners must be ready and willing to be forgiven. For the Lenten journey to be of any effect, we must be open to be forgiveness; if we cannot forgive others nor admit our faults and be forgiven by those we have offended, there is no room within us for God’s mercy. Father Alexander Schmemann writes in his book Great Lent: Journey to Pascha, “the triumph of sin, the main sign of its rule over the word, is division, opposition, separation, hatred. Therefore, the first break through this fortress of sin is forgiveness: the return to unity, solidarity, love. To forgive is to put between me and my “enemy” the radiant forgiveness of God Himself. . . . Forgiveness is truly a ‘breakthrough’ of the Kingdom into this sinful and fallen word.” God’s forgiveness is given to us via others, not alone; thus it is through mutual forgiveness that we truly begin the journey to the Resurrection. This is especially evident at Forgiveness Vespers, for the Typicon prescribes that as the faithful exchange forgiveness, the cantors sing portions the matins of Pascha.